The secret is at the bottom. Read down even though the beginning might not seem so relevant! I love sweet spots in award charts. I think it’s the Asian in me as I rather enjoy seeing that I paid less for everything (and that includes shopping for anything else) so I guess it extends to redeeming miles and flying places as well. As I’ve highlighted in red the redemption is only 25,000 miles in economy, 30,000 miles in business, and 40,000 miles in first. So remember how I said that it’s good to have a wide zone? 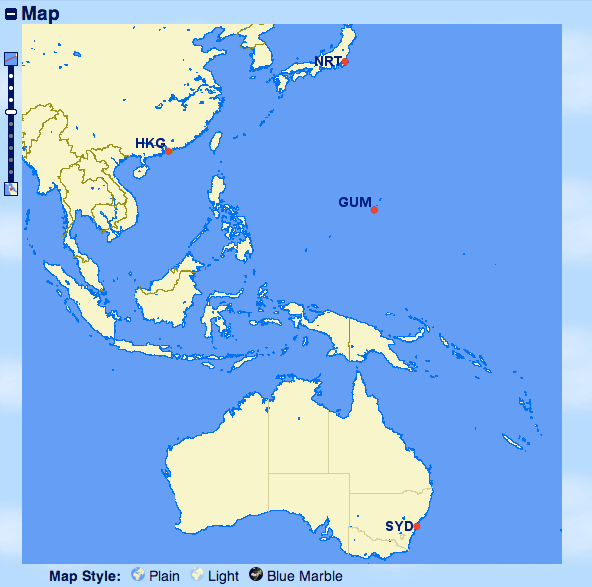 Well, with US Airways, the zone includes Australia/New Zealand (duh) and Guam. I’m sure Guam rings a bell for a lot of you (chirP) but what’s important to see is that Guam and Sydney are quite far from each other. Of course there are very few direct flights between the two city paris (Guam and Sydney) in this case so what does this mean? Connecting in Asia! The city pair even has an MPM (maximum permitted miles) of 6585 miles. Of course, US Airways theoretically allows you to have up to 25% more miles than that (or 25M) so you are allowed up to 8,231 miles of flights between these two city pairs. I say this because while there is the rule that awards are supposed to price at the most expensive region transited, I’ve at most seen this enforced once or twice out of the many calls I have had with the Dividend Miles desk for these types of awards (which don’t touch North America at all). I’ve also seen this as an itinerary suggested by the agents when s/he thinks the routing I’ve cooked up myself isn’t valid (and of course you thank them politely, and hang up call back). But now you ask, where is the international first class for 10,000 miles per segment? So if you can find award space for a nice clean routing like GUM-NRT-BKK-SYD-BKK-NRT-GUM, that means 40,000 miles and ~$200 in taxes for 4 international first class segments. You’re welcome. Of course this pairs wonderfully with a certain tricked Lifemiles route. I would argue this is probably the best redemption for international first class with US Airways if not most other mileage currencies. Of course this is not the only one. There are probably tens of these sweet spots in zone based award charts but this is one of the most lucrative. As always, if you have any questions, feel free to comment below! Note: I can personally guarantee that this is bookable as I have already ticketed and flown one of these tickets. For more information perhaps my post on booking an “interesting” US Airways itinerary may be useful. So I assume it’s one stopover only and 24 hour transits? Correct. I’ve never managed to price a stopover on this, but you could try depending on the agent. Thank you Jeff and it is going to be fun try to book it this way. Nice idea to password protect post! Wish other bloggers would follow suit. I think you meant to highlight South Pacific Zone though and not North Asia. Same prices, but Guam and Sydney both in South Pacific not North Asia. Thanks for the quick reply! and nice job on the password too! What is the LM tricked route? I’ll happily accept the answer via email! Thanks Jeff. Best post ever. I was thinking about doing something like this… Not certain if it would work, but now totally confidence boosted by your post! Thanks! Any pointers for finding 2 seats on the F legs? set up alerts. space on the bkk-syd and v.v. is generally very good, and thai will generally release a380 space in f (nrt-bkk) within two weeks of departure. Good for you Jeff. Great booking. I’m sure it was a great trip and it sure is a hot spot. I did the GUM to RAR so I had a stopover in NZ. Did it in biz. I wish I had some US Air to burn. Thanks Drew! I just did it in August, it was fantastic! Ohh… this GUM thing again….It’s been done to death. Doing one in December, with a stopover in BKK for a week. Would you mind sharing the LM secret in a PM? Could you send me too, Jeff? Thanks. I would love an email on the LM secret too please! Check my post in the trip report. It talks briefly how I used Lifemiles to position to Guam. Thanks Jeff! By the way, can you also send me the email they are referring to above regarding GUM? why did you say “Aeroplan” on the top when it’s USDM awards? Is that typo? I was all excited (I have no USDM but tons of Aeroplan/AMEX MR) until I see it’s all USDM awards/clueless reps/etc..
It’s a part I forgot to link in, haha! Haven’t had time to write others yet! I like the thinking outside of the box – and this answers lots of questions from your huge trip a couple of months ago! I especially like the fact that you password protected this post, it shows you are making an effort, but still sharing great finds. I wonder if a similar trick may work with South America, also 40k, but, limited Star Alliance partners. I may have to look into that, but, by all means, if I’m barking up the wrong tree, let me know so I can focus efforts on better areas. You could try but I don’t see anything there. How do you calculate MPM? You don’t. It’s a number that’s determined by the airlines for most city pairs. It doesn’t. As I said in my post, it’s 40,000 miles for 4 first class segments = 10,000 miles per segment. I think the part actually worth highlighting in the table is the South Pacific-South Pacific section but it’s the same mileage either way. 🙂 Great post! Mentioned briefly in my trip report post. Overdid the s**t out of this last year. 5 legs each way in F.
Love those US Airways ladies. 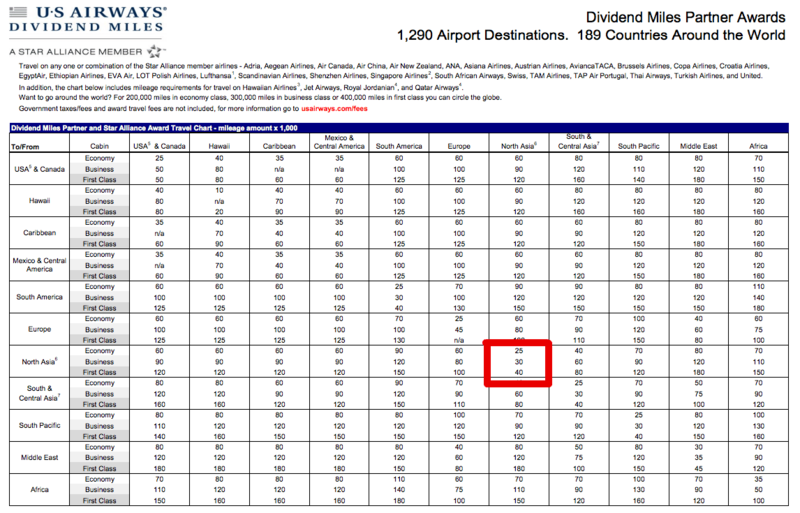 so what airlines can you book sin-syd using dividend miles on a premium cabin? I know you cant book premium with singapore airlines. You can in business class just not on their 77w and A380 flights. How is Australia and New Zealand not considered South Pacific? Nevermind. I answered my own question. By the way can I also get the same email from above please? 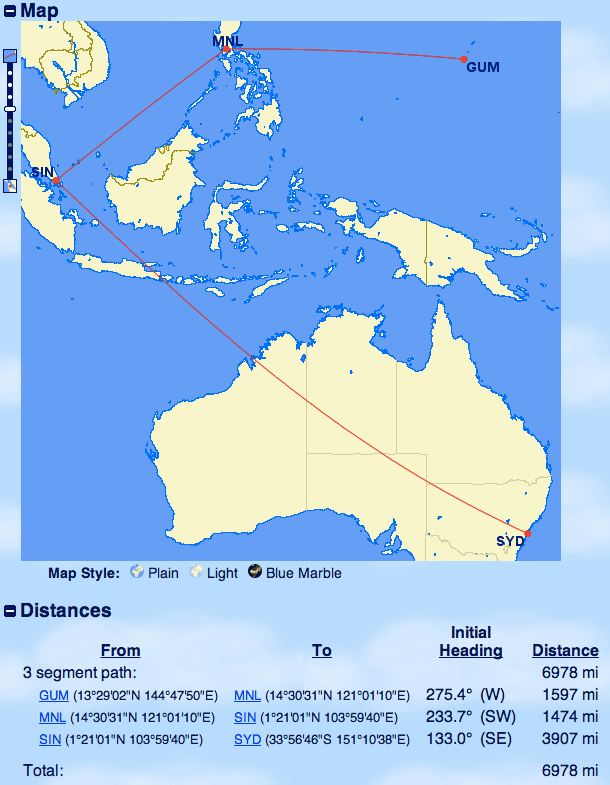 I did do MEL-AKL-SIN-KIX-GUM-NRT-PVG-AKL-MEL for 30k all J in July. A guy I was giving tips to on Flyertalk managed to wangle an 8-day stopover in NGO enroute from Australia-GUM. A good spot to exploit, especially for those living in Australia like me. 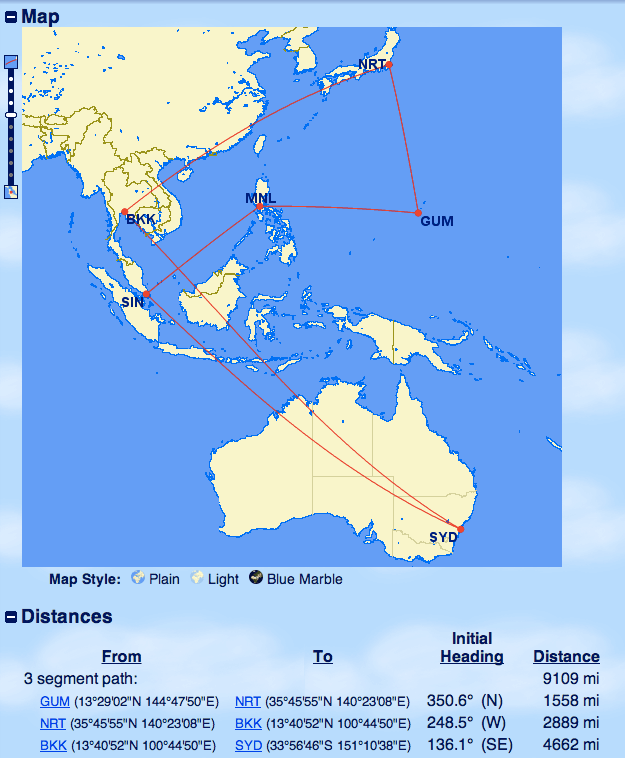 But I’d say the USDM Australia/NZ-GUM awards work very well with the LifeMiles tricked route. After all, it does mean that it is possible to get a reduced mileage ticket to Australia! Unfortunately NZ J space is getting harder and harder to find these days (on UA, at least!) and is limited mainly to the PVG-AKL or NRT-AKL segments. No, your ticket will be cancelled. No you need to fly out from GUM. But why transit MNL when there are nicer airports and nicer flights through NRT/KIX?? Coz I’m from the Philippines. It’s more convenient. No prob though coz tickets to gum are only 150usd. But knowing I need to transit through gum might as well go nrt-bkk on thai a380F. By the way can you explain how you can get sq 77w on j with lifemiles?